Sexual and reproductive health is important component of well-being of human health. It has close relationship with responsible, safe, and satisfying reproductive life. Unaccountable sexual health results in sexual and reproductive ill-health. HIV/AIDS is recently found pandemic disease, but sexually transmitted infections (STIs) are present since ancient time. The history of reproductive tract infection (RTI)/STIs is interesting from name change to treatment change strategy. It is very important to know the historical changes of disease and pattern of disease in country. The present review article is trying to evaluate various aspects of RTI/STIs including historical studies and SWOT analysis for the future challenges. Introduction: Angle's molar relationship is the most widely used classification in spite of the introduction of various other classifications. At the end of the treatment, the molars are finished in a Class I, II, or III molar relation. Thus, it is important to know the ideal inclinations of upper and lower 1st molars, thereby assisting in achieving a stable relationship. 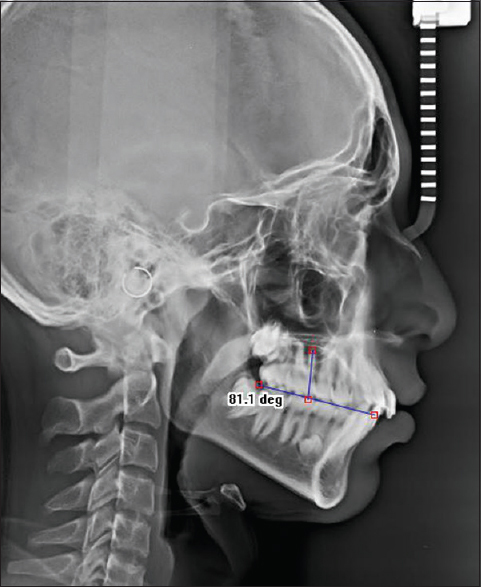 Aims and Objectives: The aim and objective of this study was to evaluate the mesiodistal inclination of permanent maxillary and mandibular first molars in Angle's Class I, II, and III molar relationships in relation to the occlusal plane. Methodology: Lateral cephalograms of 16–30-year-old individuals with Class I, II, and III molar relations were selected and traced in Dolphin imaging software, and the angle between the first molar and occlusal plane was calculated. Results: There was a statistically significant difference in the inclination of maxillary 1st molar in between Class I and Class III. No significant difference was noted in the inclination of maxillary first molar in case of Class I and Class II. In case of mandibular molars, there was a statistically significant difference in case of Class I and Class II and between Class I and Class III. Conclusion: When the end molar relationship of a case is planned to be Class I, the upper molar should be at an angle of 84.12° to the occlusal plane. When the end molar relationship of a case is planned to be Class II, the upper molar should be 84.15° to the occlusal plane. When the end molar relationship of a case is planned to be Class III, the upper molar should be inclined at an angle of 87.07° to the occlusal plane. Aim: To study the sociodemographic and immunological profile of HIV seropositive patients attending antiretroviral therapy (ART) center of a tertiary care hospital. Methodology: This was a retrospective observational study conducted at an ART center of a tertiary care hospital from October 2016 to December 2017. It was a retrospective cohort study. Results: In our study, the total number of patients was 295. Majority of the patients were between 15 and 45 years of age. 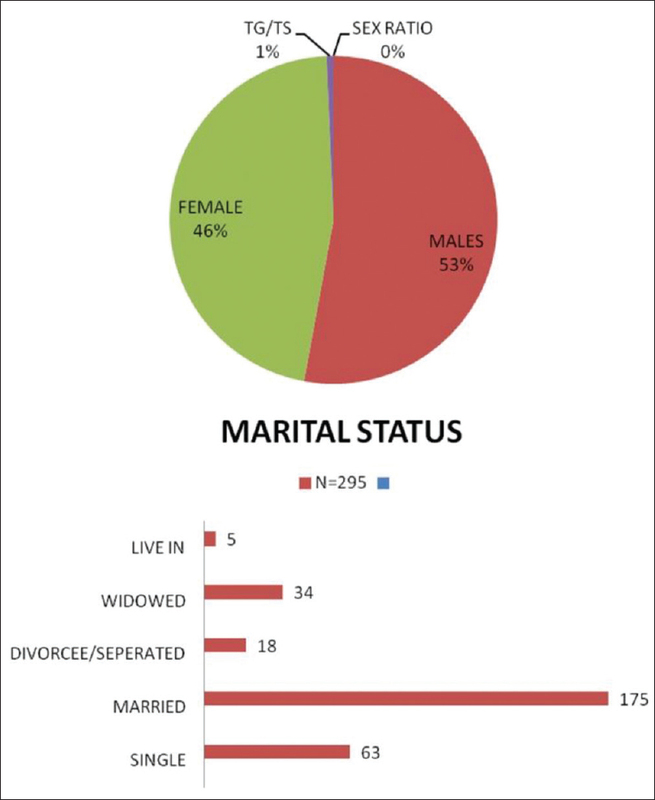 Males were 52% and females were 46%, with a male-to-female ratio of 1.3:1. Married tribal patients were the most affected. Majority of the patients were homemakers and nonagricultural workers; larger group belonged to low socioeconomic status. Heterosexual transmission was the commonest route of infection. Conclusion: Reproductive age group, low socioeconomic status, illiterate, tribal population, and homemakers were found to be associated with HIV positivity; heterosexual transmission was the commonest mode of infection. Background: Drug utilization evaluation is conducted to determine the rational use of drug by describing the drug usage pattern. This study aimed to describe the drug utilization pattern of metformin and its oral formulations. Objectives: The objectives of the study were to identify the prescribing pattern of metformin in fixed-dose combination (FDC), along with adjuvant antidiabetic therapy and it is prescribing in different formulations. Methodology: This is an observational study in which a total of 100 type 2 diabetic patients visited to or admitted in General Medicine Department, Dhiraj General Hospital , Piparia, Vadodara, were included as per our inclusion criteria. Result: Among 100 type 2 diabetic patients, 15 patients received monotherapy and 85 patients received combinational therapy of metformin. Out of 120 FDCs of metformin prescribed in 100 patients, plain (conventional release) formulations were most commonly prescribed (39.17%). Among FDC therapy of metformin, glimepiride + metformin, and glimepiride + pioglitazone + metformin combinations were most commonly found. As an adjuvant therapy with metformin, human analog insulin was most commonly prescribed. The sulfonylureas (SUs) were found to be the most commonly prescribed oral antidiabetic drug class along with metformin (SUs). In this study, we found 49% of the patients receiving metformin with low medication adherence. Conclusion: The practice of metformin monotherapy is limited and it is frequently prescribed in combinations with other antidiabetic agents. We observed an almost equal utilization of different oral formulations of metformin. A low medication adherence with metformin emphasizes the need for appropriate patient counseling and therapeutic interventions. Toxic epidermal necrolysis (TEN) is an uncommon; however, life-threatening dermatological condition which occurs most frequently by the use of drugs. Some group of medications, such as antiepileptics, antibiotics as well as antivirals, can induce such adverse drug reaction (ADR). Among the antiepileptics, carbamazepine is widely prescribed in case of epilepsy and trigeminal neuralgia. 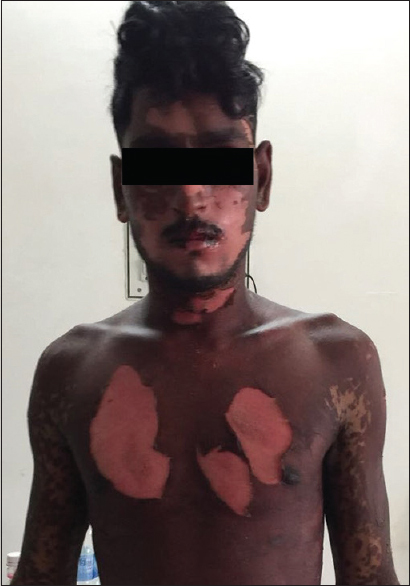 Here, we report a case of 22-year-old male with seizure disorder with a history of carbamazepine-induced skin lesions. Patient along with caregiver had approached local physician for increased seizure episodes but did not mention about the allergic history, and he was restarted on carbamazepine. As a result, the patient again developed skin lesions for which he consulted the dermatology outpatient department of the hospital. After outpatient department consultation, he was admitted to the ward for further clinical management. On hospitalization, the patient was diagnosed with carbamazepine-induced TEN (body surface area >40%). The management included immediate withdrawal of carbamazepine and supportive therapy with corticosteroids, antibiotics, antiepileptics, and antiallergic medications. After 15 days of rigorous treatment and hospitalization, the patient was discharged, as erosions healed with reepithelization. Based on this case, it can be concluded that reinitiation of a medication with a history of known allergy can result in TEN which is a serious life-threatening ADR. For the prevention of such ADR, thorough patient medical history should be obtained on each consultation. In addition, the patient and caregiver have to be informed about the clinical condition and the drugs which can provoke such adverse reaction. 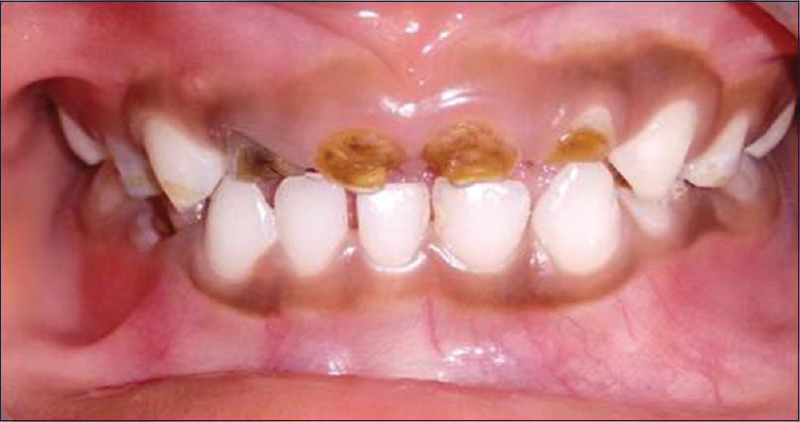 Managing a child with severely mutilated anterior teeth is a task for pedodontists. Although various options are available today for esthetically rehabilitating anterior teeth, they are costly and technique sensitive. In the present case, we esthetically rehabilitated a 5-year-old child with severe early childhood caries with chairside fabricated indirect composite shell crowns. The technique described in this case report is simple, requires minimal compliance from the child, is less technique sensitive, and can be completed in an accepted chairside time. Online since 02nd August 2018.